Dr. Esther Conwell earned a Ph.D. in atomic physics at a time when few women were entering science. Her pioneering semiconductor research earned her a place as one of Discover magazine’s 50 Most Important Women of Science in 2002. 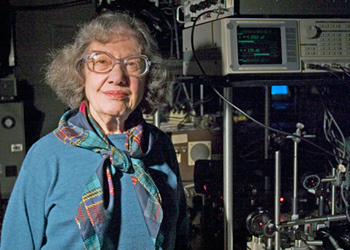 Conwell’s research, exploring how electric fields affect the movement of electrons in semiconductors, earned her an uncommon triple membership in the National Academy of Sciences, the American Academy of Arts and Sciences, and the National Academy of Engineering, among the highest honors a scientist of engineer can receive. Conwell is the only member of the University of Rochester to hold such a distinction. She was the winner of the Thomas A. Edison medal of the Institute of Electrical and Electronics Engineers (IEEE) in 1997 – the first woman in the 93 years of this award, which has gone to such eminent scientists as Alexander Graham Bell, Vannevar Bush, and Michael Pupin. Among many other awards that she has received during her distinguished career are the Achievement Award of the Society of Women Engineers and an honorary doctorate from Brooklyn College. She has authored or co-authored several books, more than 270 scientific publications in chemistry, biophysics, and physics, and several patents. In 2002, Discover Magazine named Conwell one of the “50 Most Important Women of Science” and most recently, in 2006, the University honored her with a Susan B. Anthony Lifetime Achievement Award for her efforts in advocating and promoting women in science. Conwell has worked very successfully with undergraduates at Rochester, serving as their research mentor under the auspices of a National Science Foundation Research Experiences for Undergraduates program. These efforts were acknowledged by her receipt of a Dreyfus Senior Faculty Mentor Award in 2004. Conwell earned her master’s degree in physics at Rochester and her doctorate at the University of Chicago where she was an assistant to Nobel Prize winner Enrico Fermi and did her doctoral work with another Nobelist, Subraman Yan Chandrasekhar. From 1946 to 1951, she taught at Brooklyn College, her undergraduate alma mater. She also spent a year as a visiting professor at the graduate school of the Sorbonne, Lécole Normale Supérievre, University of Paris in 1962, and a semester at MIT in 1972 as the Abby Rockefeller Mauzé Professor. From 1973-2000 she was a senior scientist in the Xerox Research Laboratories. Dr. Conwell is married to the novelist Abraham Rothberg and is mother of fellow scientist Dr. Lewis J. Rothberg.